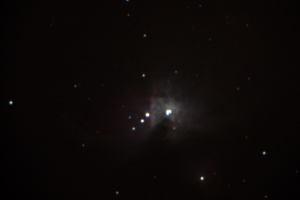 Technique (M42): 33 approximately 30 second lights at 800 ISO. Total exposure time of approximately 17 minutes. 6 darks. 50 biases. 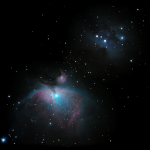 Technique (M43): 15 approximately 30 second lights at 800 ISO. 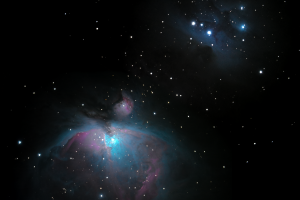 Total exposure time of approximately 8 minutes. 6 darks. 50 biases. Prime focus. Stacked with Deep Sky Stacker. Post-processing in Photoshop. Technique: 46 lights between 1600 and 6400 ISO with exposures varying from 15 to 30 seconds. Total exposure time of 22 minutes 36 seconds. 16 darks. 50 biases. The Pillars of Creation have long been one of my favorite deep sky objects. 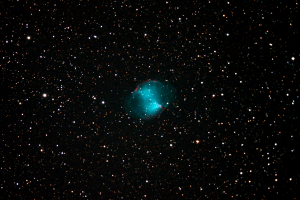 After my recent success with the Dumbbell Nebula I set a goal of capturing the pillars in a similarly successful shot. Tonight was the clear and still night I needed to meet that goal. Technique: 9 lights between 1600 and 6400 ISO with varying exposures. Total exposure time of 5 minutes. 5 darks. 52 biases. 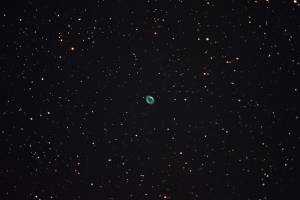 Tonight’s bright waxing gibbous moon gave me some difficulties and I was only able to salvage 9 exposures of the ring nebula. The nebula itself is only about 1.3 arcminutes in diameter making it difficult to see with smaller telescopes and binoculars. Fortunately, it’s blue color from oxygen emission lines are easy to pick up by an unmodified camera. 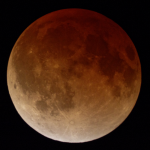 The outer red hydrogen emissions tend do take longer exposure times to render. Technique: 20 lights between 1600 and 6400 ISO with varying exposures. Total exposure time of 10 minutes 18 seconds. 5 darks. 52 biases. I had a small window tonight between when the sun set and the clouds rolled in where there was a clear sky. This gave me the chance I had been waiting for to use my new 2″ visual back which almost completely removed the vignetting seen in my most recent photographs. Tonight was a spur of the moment night for astrophotography. Sarah and I were outside enjoying the Perseids when I realized it was the clearest night I’d had in months. 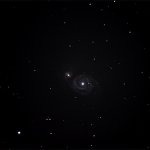 So, I set up the telescope in the dark and took some quick shots. This was one of them. As with my previous shot of the Andromeda Galaxy, here are a lot of things wrong with this picture such as the focus, star trailing, noise, and vignetting. These are mostly due to the fact that I basically just whipped out my telescope and started shooting without any preparation. 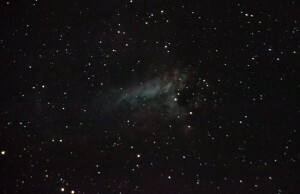 I expect to get much better shots of the Omega Nebula in the future. Technique: 25 second exposure at 1600 ISO in prime focus. 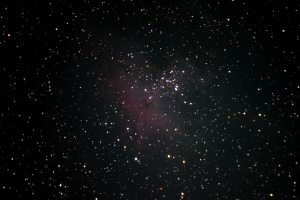 This is my first successful attempt at deep sky imagery and my first time seeing some color in a nebula (everything you see here is natural). 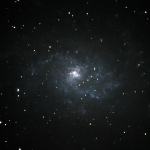 Thanks to my new SCT telescope, the Celestron CPC 800, I am now able to take some long exposures (but not too long since I’m using an altazimuth mount). 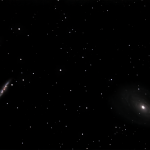 Too bad M31, the Pleiades, and most of the deep sky I’m familiar with are setting early now. I had to take this within about a 20 minute window before it set. Hopefully I can get better focus next time.